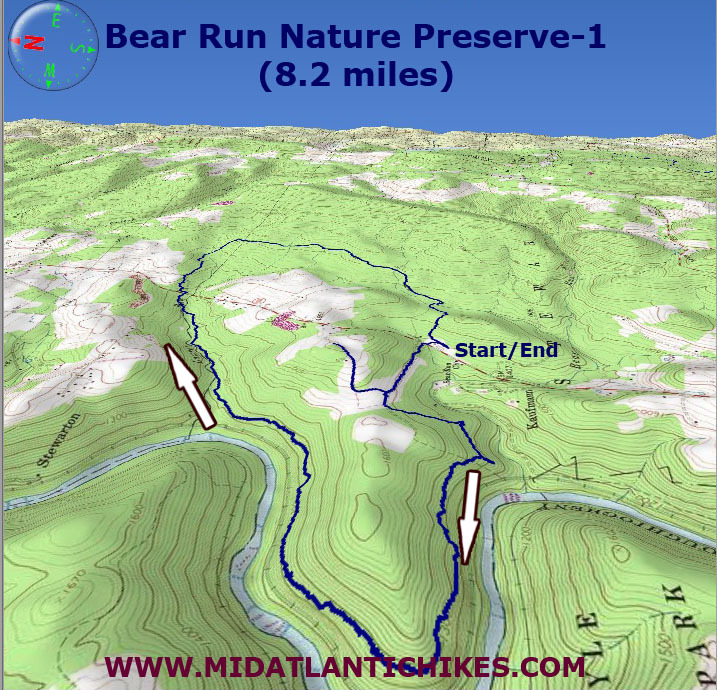 Description: The Bear Run nature Preserve, at over 5,000 acres, is the largest holding of the Western Pennsylvania Conservancy. It offers 20 miles of hiking trails, backcountry camping and four established campsites (first come, first served reservations at the trailhead kiosk), as well as hunting and fishing. 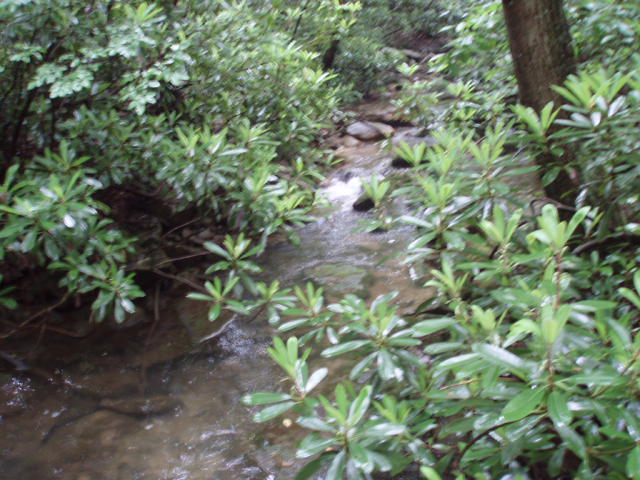 The forest is varied with hardwoods on the ridges and Rhododendron and Hemlock in the stream hollows. Near the trailhead parking lot pine has been planted to prevent erosion. 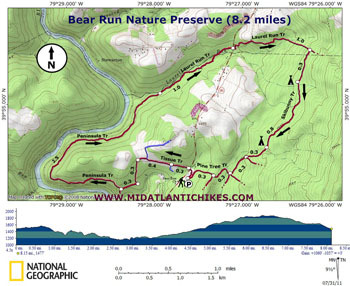 Described here is a moderate 8.2 mile hike with 1100 feet of elevation gain, most of it quite gradual. The trailhead is in a parking lot behind a converted barn. Trail Notes: Walk down the driveway, cross Rt 381. Jog to the right a bit before turning left, around a gate, on a gravel road. This is Tissue Trail. In 0.3 miles the road splits. Stay to the right (straight). In 0.4 miles the road curves to the right, through an open meadow. 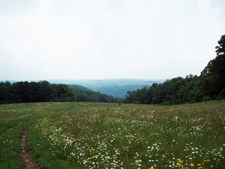 There are some nice views of the Laurel Highlands from there but the Tissue trail continues straight through the meadow without turning. In 0.4 miles from the initial fork turn left onto the Peninsula Trail. Pass a parking area on the left for Falling Waters in 0.3 miles. Continue straight and in 0.3 miles arrive at a spur that leads to a mostly grown in view of the Youghiogheny River Valley. 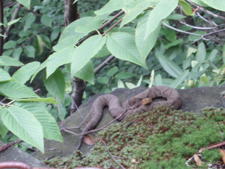 Continue on as you enter Ohiopyle State Park. 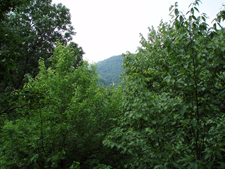 The southern portion of the trail is a sidehill footpath that climbs and descends the mountain in short spurts. As it turns to the east, on the north side, it joins an easy to walk on old grade. In 2.5 miles from the vista it changes into the Laurel Run trail. You can get glimpses of the run from the trail but to best enjoy the water follow one of several spurs down to it. The trail leaves the grade to avoid some perpetually wet spots and crosses the run on a narrow bridge before arriving at Rt 381 in 1.0 miles from the ending of the Peninsula Trail. Cross the road to pick up the continuation of the trail. At times it is a footpath and at other times it follows a road. In 1.0 miles turn right onto the Snowbunny Trail. This wide road either runs flat or downhill. Pass nice campsites on water in 0.3 and then another 0.8 miles. 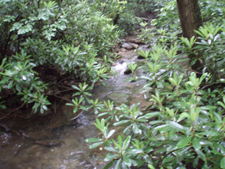 The Rhododendron Trail and then the Teaberry Trail both come in from the left at 0.3 mile intervals. At the last intersection turn right onto the Pine tree trail and follow it for 0.6 miles back to the cars, passing Aspen trail on the left at the mid-point. Outing Critique: This was an enjoyable hike, but much of the early part (the Peninsula trail especially) was badly overgrown and COVERED in poison ivy. At two points we lost the trail--the point where you turn off across a small bridge to cross 381 is especially easy to miss. The pine tree trail at the end is labeled as the Tree Trail--in the last half mile of the hike, a laminated sign points you down a service road, while the trail blazes continue to the left, but both will get you back to the trailhead.